Where are you from? Your profession (or former one, if retired)? I'm originally from Arkansas, went to Georgia Tech, and have lived in Jacksonville, FL for the last 40 years. I'm am engineer, retired from JEA (the Jacksonville electric water and sewer utility). When and how did you become interested in paddling? I have always liked being on the water and have done a lot of sailing. 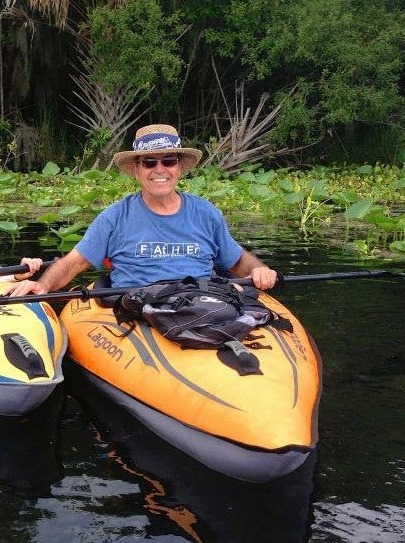 My wife Kathy, brother Charlie, and I had inflatable kayaks that we used for short day trips in the creeks and rivers of northeast Florida. Two years ago, Charlie and I saw an article about Paddle Florida, went to an informational meeting at REI (led by Jill), and six of us signed up for the Dam to the Bay trip. It was a great trip, and three of us did it again in 2017. And we bought recreational kayaks. Where is your favorite place to paddle? My favorite paddling, besides the Paddle Florida trips, are the many creeks and marshes close to home in Jacksonville. A few of us paddle once or twice a week in northeast Florida. Sometimes we launch next to a bridge in the middle of town and in minutes are paddling through Old Florida, with marsh on one side and backyards on the other. Other times we drive 30 minutes to launch in a national, state, or city park and paddle for three hours without seeing another boat or person. Lots of birds, turtles, and fish. What’s the most interesting thing that ever happened to you on a paddling trip? Once we launched at Fort Clinch on Amelia Island and paddled across the St. Mary's River inlet to Cumberland Island in Georgia to see the wild horses. On the way back we had to stop as a nuclear submarine with its tenders passed by on its way out to sea. Having an airboat cut a trail for us through the water lettuce on Paddle Florida’s Ocklawaha Odyssey has to be my strangest paddling experience. How many Paddle Florida trips have you gone on and to where? Besides the Dam to the Bay trip on the Panhandle’s Ochlockonee River, I also joined Paddle Florida in December 2016 for the Ocklawaha Odyssey. Quite an adventure—water lettuce, airboats, and squalls—oh my! I plan on joining Paddle Florida again this November for the Flagler Coastal paddle, and next February and March for the Calusa Blueway and the Choctawhatchee Challenge. What advice do you have for folks considering a Paddle Florida trip? Just go! The paddling, the food, the truck (which carries your stuff), and the folks are all the best. Bring a camp chair.